Manufacturer of a wide range of products which include arete shape cutting machine, diamond laser cutting machine, arete saw diamond cutting machines, tiny pinak laser cutting system, laser sawing machine and rough diamond planner. Relying on our expertise and know-how in this field, we are well-known as one of the prestigious organization in offering a wide range of Arete Shape Cutting. This range of Arete Shape Cutting is developed at well equipped production unit by making use of sophisticated machines and high grade quality raw materials. Product offered by us is highly demanded in various different places due to their unique designing and nominal prices. This product is available in several designs as per the specific demands of our valuable customers. We are the prominent manufacturer and supplier highly involved in providing an optimal quality range of Diamond Laser Cutting Machine. The offered cutting machine is widely used to cut and shape a diamond into the desired shape, before it gets to the market. Our Diamond Laser Cutting Machine is widely acknowledged among our clients for its excellent and reliable performance. Widely accepted in jewellery industry, clients can avail this machine from us at affordable price. Can cut in Straight and L Type shape Greater Yield: Recovery of extra pieces, which leads to higher yield Smart Laser cutting processing using Smart Set and Advance Smart Set to reduce breaking using bending. 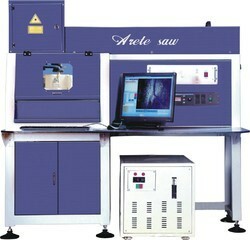 Can work with any Existing Laser machines Operator Friendly Smart Sawing. We hold expertise in offering a quality myriad of Arete Saw Diamond Cutting Machines. This Arete Saw Diamond Cutting Machine is widely demanded in the market due to its superior quality and hassle free performance. Also, this product is precisely developed and tested as per the demands and requirements of the clients for their complete satisfaction. Our prestigious clients can avail our entire products range from us at market leading prices. This Arete Saw is widely applauded in between our customers for its optimum performance, longer working life and easy installation. 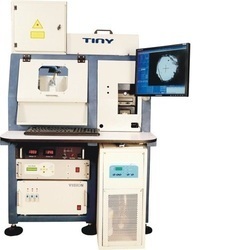 Our product range is checked for quality under various set parameters for Industry. High production with optimized weight loss It can work with Lamp Pump, Diode Pump and Fiber Laser. More than 50 Installation in Surat and Mumbai Can work with any motion control card base Laser System using advanced electronics kit. Vision Embesoft Solution is manufacturer of Tiny Pinak Laser Cutting System. 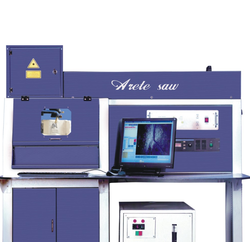 Catering to the diversified requirements of our esteemed clients, we indulge ourselves in offering a superlative assortment of offering a wide assortment of Laser Sawing Machine. Designed using the finest components with an aid of ultra modern technology in accordance to industry set standards, its quality is our assurance. Highly appreciated among our client base, its qualities like high on strength, low maintain cost and durability brings delight to our client's. Vision Embesoft Solution is manufacturer of Rough Diamond Planner. 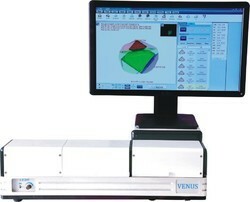 Accurate 3D laser scanning for measuring groove and cavity of the Diamond. Advanced Vision technology provides accuracy upto one millionth of a carat. Video based fast and accurate measurement system. Marking options, Light, Medium and ×Dark, provide flexibility to the user for marking darkness. Embedded generic or factory-proprietary price list for best value return. Integral diamond calculator enables examination and determination of different cut proportions. User-friendly report editor enables customized design of reports and labels. Easy operating & Low maintenance.